A few months ago I got picked in a second chance lottery for Red Sox-Phillies tickets. So, of course, I purchased said tickets. When I say it was forever ago, I mean the game was on May 20th and I purchased the end of February. My usual Phillies game partner in crime, Steve “Chinstrap” Zegray was getting ready to get back on the road with his band (The Dirk Quinn Band) so I asked my friend Pat Farley to come along. He was a little on the fence until I told him what I wanted to do: go early and eat as much stuff as I could before the game started. He then jumped on the game train. So, that’s what we did. The very first thing we made a beeline to was the stand that sells The Schmitter. 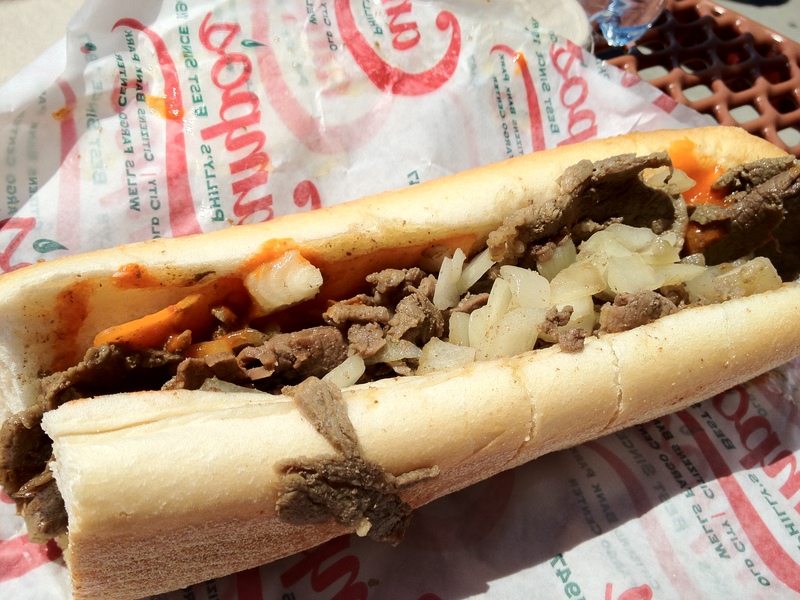 The Schmitter is my all time favorite thing they sell in Citizen’s Bank Park. I have been known to walk all the way around the stadium to get it. When the season is over, it’s all I think about to get me through the winter. When it’s baseball time, I get excited to eat one. It also helps that it is named after my all time favorite player: Mike Schmidt. 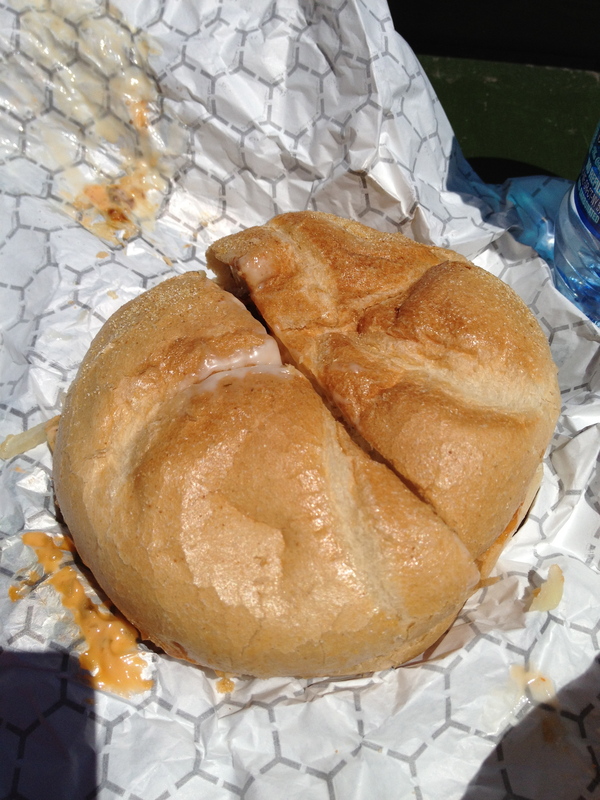 The Schmitter is a sandwich that was created by McNally’s Tavern in Chestnut Hill. In fact, you can get one there all year round (Why don’t I? I am lazy. Next!). So, when I got the Schmitter, Pat and I were a little bit perplexed. Besides being yelled at by the lady at the counter to “walk thru the line” (a maze of rope…with no one in it), the sandwich was missing something. Namely, meat. Let’s talk about what this delicious concoction is, ok? 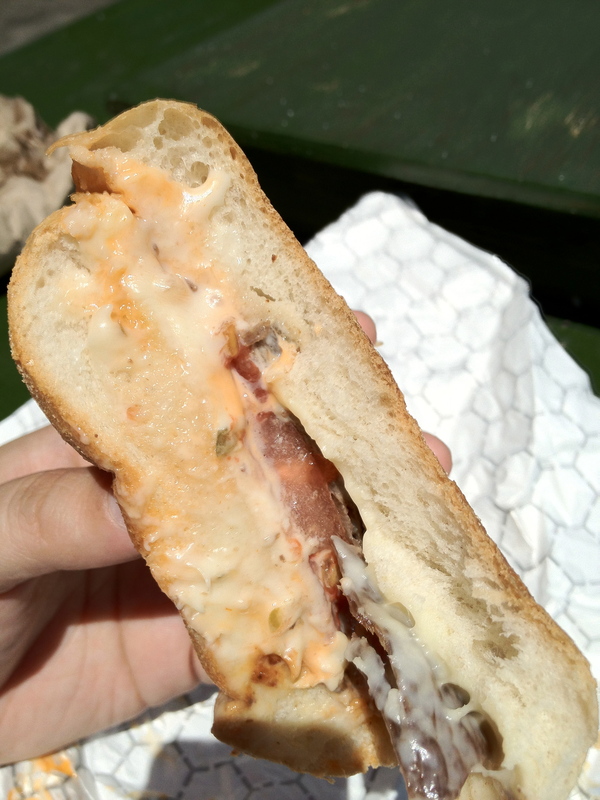 They broil the inside of a kaiser roll and from the bottom up it’s: cheese, beef, fried onions, tomatoes, more cheese, grilled salami, special sauce (this makes the sandwich, believe it or not) and more cheese. Sounds awesome right? A gooey, sloppy mess of a delicious piece of awesome. It’s the sort of thing you drop down the front of your shirt and when no one is looking, you try and lick it off (Is that just me? Can’t be…). The second thing we ate was something I had never had before, that Pat spied. He had said it was fantastic, so how can I turn that down? Answer: I cannot. Campos is a sandwich place right on Market Street in downtown Philly. I worked around the corner from there for quite awhile and love the work they do. great sandwiches, great bread and decent prices. They have a stand at the ballpark and we got sucked into ordering…The Heater! 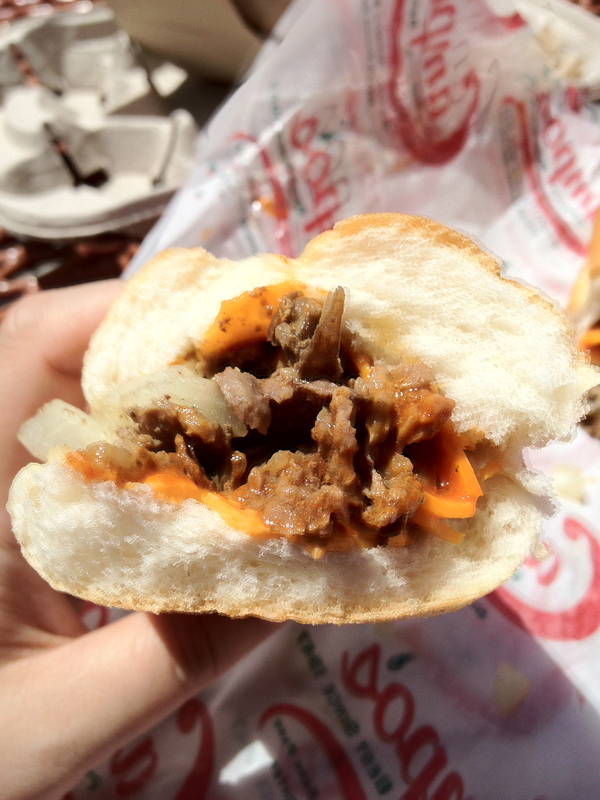 The Heater is a spicy cheesesteak with Jalapeno Cheddar and Buffalo Sauce. Oh yeah. I was excited that it had Jalapeno Cheddar and not jalapenos because, uh, I can’t eat the seeds anymore unless I am looking for a nice weekend trapped in the bathroom. TMI? Perhaps. Moving right along…The Cheese itself is welfare cheese orange (say what you will, that cheese made fantastic grilled cheese sandwiches). 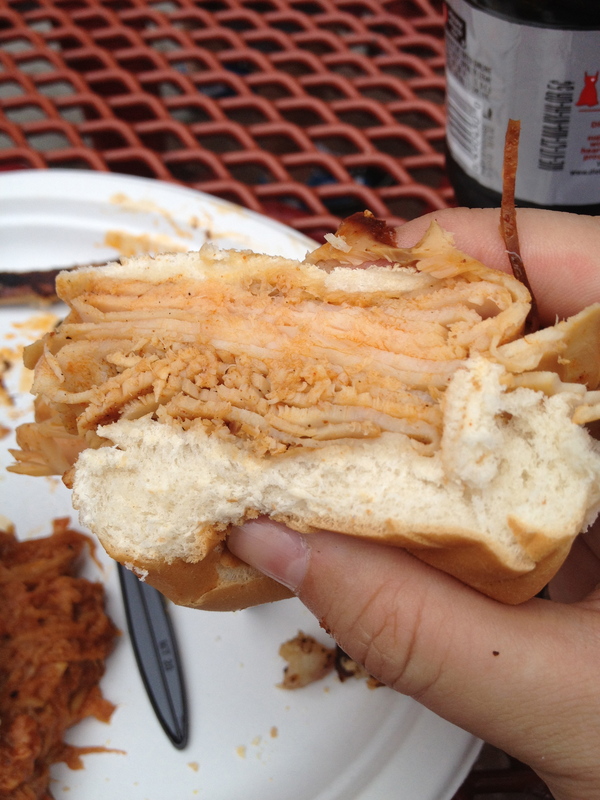 The sauce is drenched into the sandwich: meaning it doesn’t just make a cursory walk thru. And of course, the fried onions tie it allll together. The only nitpick I have with it, is that I think it could have used more meat. I know the economy is bad and all, but come on. I hate ordering “extra, extra meat”. But besides that, this sandwich is solid, and Campos is a place you should always hit when in the ballpark! Next up was a stop at Bull’s Bar-B-Que. Greg “Bull” Luzinski played 10 years in left field for the Phillies and now he owns this place in the new ballpark (in 1989 he was also inducted into the National Polish-American Sports Hall Of Fame). They serve up all kinds of stuff: pulled pork, ribs, and all sorts of sides. They are also a go-to place for those who have to eat Gluten-Free. 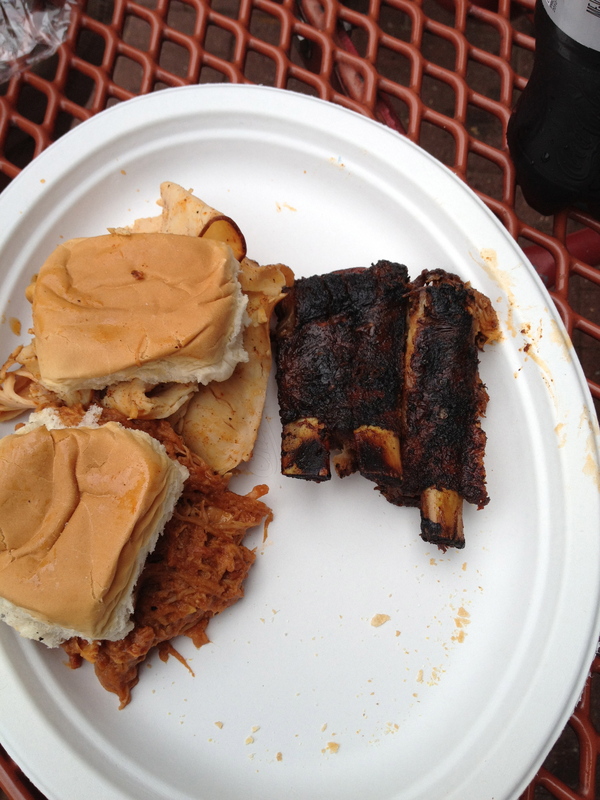 We decided to get the sampler: one small bbq turkey sandwich, one small pulled pork sandwich and one small serving of ribs. It wasn’t exactly cheap but it wasn’t too expensive. I wasn’t thinking when we were ordering and I assumed it came with a side. I guess it didn’t. Altho the last thing either of us needed was a serving of beans. Ha. 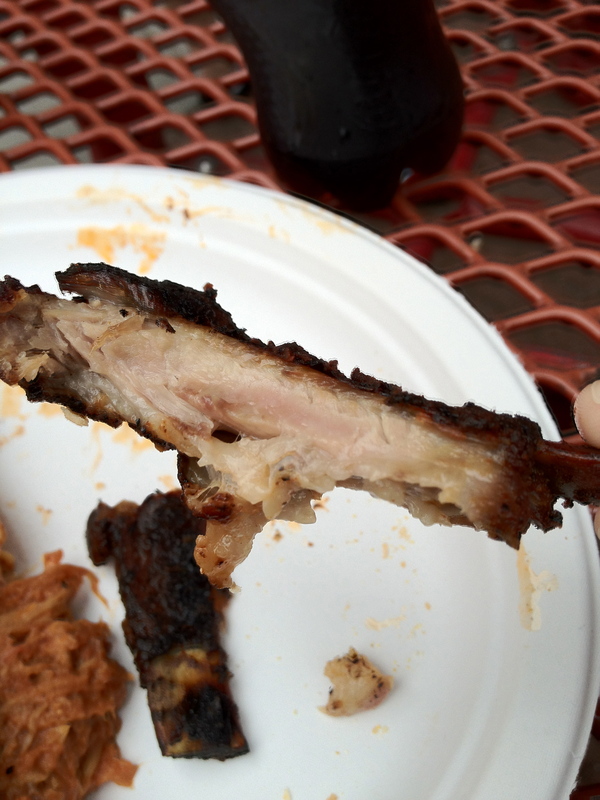 Anyway, first up was the ribs. As you can see, there wasn’t too much there, but it was enough for the two of us, as we were walking towards stuffed. Pat found the ribs to be good but kind of salty and I had to agree. Not salty enough to not finish tho. Ay-o! They had a nice crust on them and overall, they weren’t bad. What is a nice touch at Bull’s is that they actully have some sitdown tables so that you can actually eat like a person instead of leaning over a bit of metal or dripping sauce on your pants while you try and eat back in your seat. It is also helpful with little kids if you don’t feel like covering all their clothes with stain remover. Next up is the little BBQ Turkey sandwich. I gave it a “meh” and Pat was not at all enthralled by it either. It seemed like it was just turkey lunch meat that took a swim in some sauce. It was not at ALL what we thought it would be and a lot more disappointing then I expected, which surprised me. Everyone is always babbling on and on about how awesome it is. The roll was nice tho, and the sauce wasn’t too overpowering. And honestly, there was a LOT of that turkey on there, that’s a small plus. So, while it wasn’t the awesomest of all time, it was probably the most disappointing. Which brings up to the Pulled Pork sandwich. I’m actually really good at making pulled pork, believe it or not. When you are good at making stuff, you feel jaded when someone offers it to you. But I’ll tell ya, this wasn’t bad. The pork was chopped down a little bit much for me, but it is a pretty standard pulled pork and probably would have been good on a nice kaiser roll with a mountain of napkins. I was really into it and I have to admit, I forgot to take a picture. Please forgive me, hungry readers. Now we come to the part of the day where Pat and I decided we needed some sort of dessert. It only makes sense right? They had a lot of ice cream in different Turkey Hill forms, which I am all for, but we were looking for something different. I mean, how many times can you have ice cream in a little batting helmet? (altho I do love it!) I thought I read about a cupcake kiosk over by the one Turkey Hill stand and low and behold, there it was! We sauntered over, neither of us being very into baked goods but into something different. The 2 ladies who were working there looked like they were breaking down the stand when we got there. We pointed to the 3 on the top shelf and asked what they were. 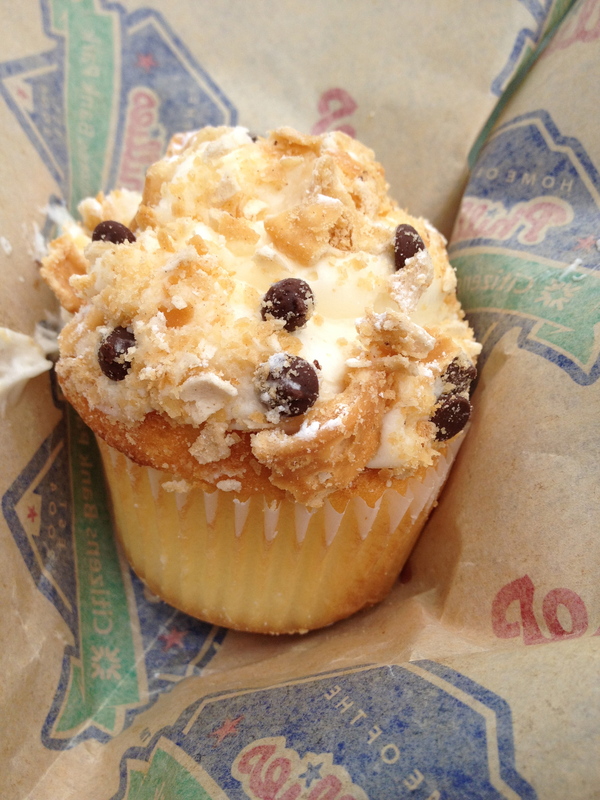 When she said CANNOLI CUPCAKE, we hi-fived and did a little dance (or, just ordered them, depending on how imaginative you are). This thing had the lightest, most delicious cake bottom, with the top made of fantastic cannoli cream and full size chocolate chips. On the top there were bits of cannoli shell sprinkled about. You know how when something is really, really good, the people eating stop talking and don’t even notice? Yeah, that was us, standing at the hi-top table, pretending we both didn’t want to lick the paper that had the extra frosting on it. “You go ahead”. “No, you go ahead!”. It was like a Chip and Dale cartoon. In the end, we both had extra frosting, because there was SO MUCH OF IT and it was awesome! The cupcake was $3 but it was easily split by the both of us, which I thought was cool. That was the day of eating. We had beers as well and walked around to fool ourselves into thinking we were burning it off (escalators don’t count right?) but it was a great day and the weather was awesome. The Phils got their asses handed to them by the Sox, but hey, ya can’t have everything, right? My favorite thing was the Cupcake, followed super close by The Heater. That sandwich was awesome and I’d like to try it as a chicken cheesesteak! Pat’s fave was The Heater but he says the Cupcake was way better then expected & made it a tough choice as he is not much of a Cupcake guy. So there ya have it! Will there be a second part of this entry? Possibly! Stay tuned and find out, the baseball season is just getting started!